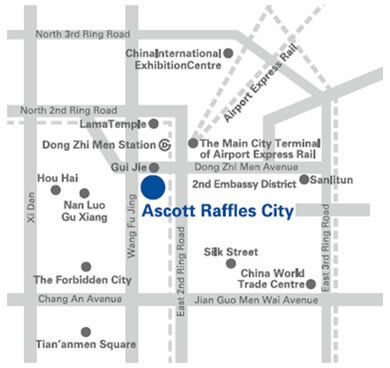 Ascott Raffles City Beijing is centrally located in Dongzhimen, Dongcheng District, one of the most vibrant areas in Beijing, Dongzhimen which means “East Gate” is the name of one of the gates in Beijing’s old city walls. The property sits diagonally across Beijing’s largest public transportation hub (Dongzhimen) where subway lines 2 and 13 connect. From this hub, it only takes 16 minutes to reach the Beijing Capital International Airport via the newly-built light railway. 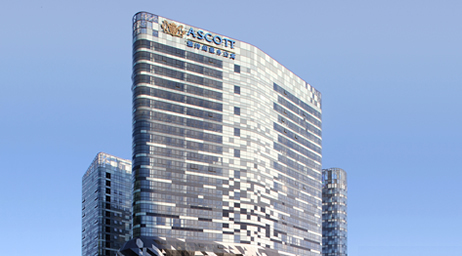 Ascott Raffles City Beijing is also near the second embassy district in Beijing, where the German, Canadian, Spain embassies and many Fortune 500 foreign enterprises are located. The area is rich in cultural heritage, and only a 15-minute drive to Beijing’s top attraction and UNESCO World Heritage Site – The Forbidden City. 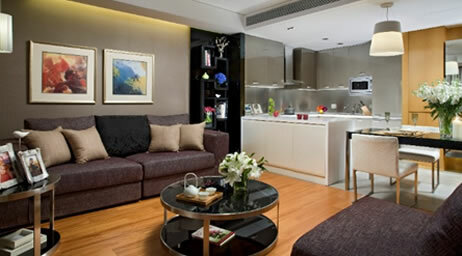 Other nearby leisure attractions include Food Street (Gui Jie) and Sanlitun nightlife district. 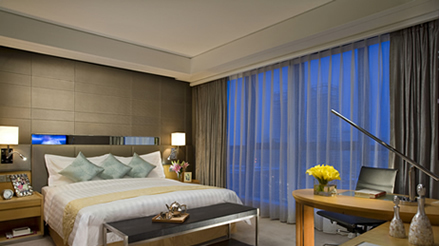 The serviced residence is part of Raffles City Beijing, an integrated lifestyle development comprising a retail mall, an office tower and residential apartments. 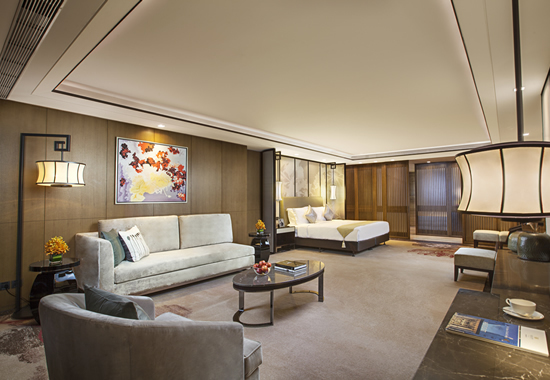 Each apartment in Ascott Raffles City Beijing has a fully-equipped kitchen and the living and dining areas are set apart from the bedroom. The 24-hour security system with closed circut TV and our security personnel provides a safe living environment for you and your family. With our efficient business support services and audio visual equipment, working remotely has never been more convenient. You can conduct meetings or even organize a cocktail party in the lounge. After a long day of work, enjoy a few laps in the swimming pool or working out at the fully-equipped gym. During your stay, experience Ascott’s signature Heartware service – discreet and always striving to exceed your expectations. Room Rates are per night / month and subject to 6% VAT(Value Added Tax). 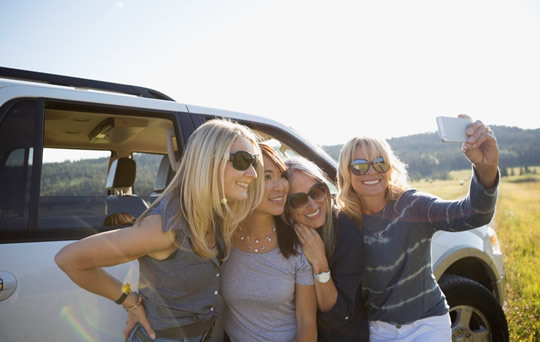 All incidentals are subject to VAT(Value Added Tax) with different ratio from 5% to 17%. 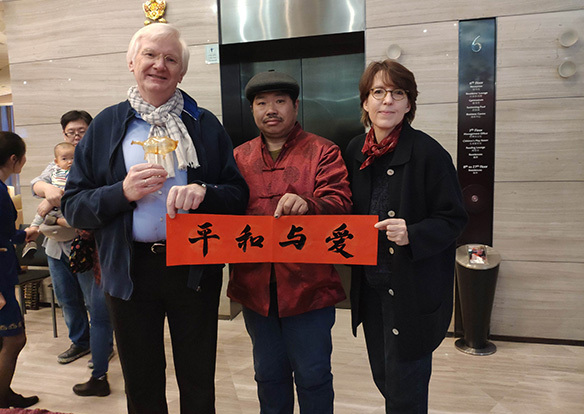 Enjoying the Spring Festival customs culture and feeling the Spring Festival's atmosphere.Recently, Ascott Raffles City Beijing held a special activity - "charity - Temple Fair" for all the residets. Listening to allegro, enjoying traditional Chinese cultural performances, seeing folk unique, and tasting Beijing characteristics snacks, which attracted every residents. Lion dance performance won the bursts of applause. Richful and colorful temple fairs created a mellow "flavor of the New Year", which not only enabled residents to experience the authentic Chinese New Year with Beijing flavor, but also donated all the income from the activities to Beijing Red Cross society, which brought joy to the residents and contributed to the cause of public welfare. 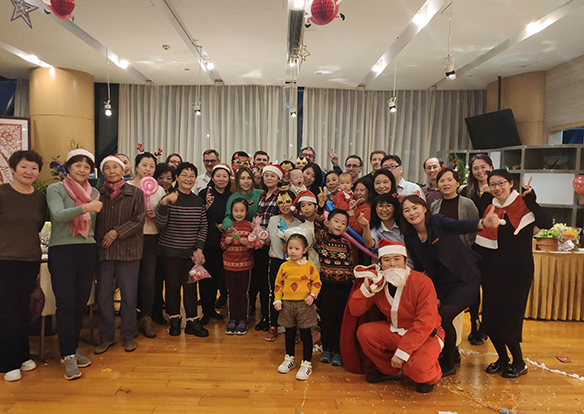 With the approach of Christmas, Ascott Raffles City Beijing invited the residents to attend the annual Christmas party. During the celebration, there were not only scrumptious Christmas food but a wonderful performance of wine mixing too. The close-up magic took everyone's breath away and brought the party to a climax. With a variety of interactive games and lucky draws, all the residents gained lots of gifts. The party ended with a warm and lively atmosphere. Although all the residents lived in a different place, they still felt the festive atmosphere as well as the warmth and happiness of home! 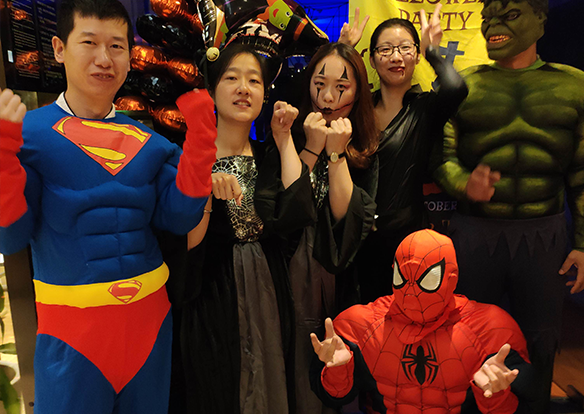 On 31st October, 2018, Ascott Raffles City Beijing held a Halloween Cosplay Carnival Party. We offered complimentary scrumptious snacks, an artistic face painting to add more scare to residents' costume, fun games and giveaways awaits to the residents. A “Trick or Treat” parade for all kids dressed in a devil costume. This Halloween night brought residents a happy and wonderful journey. 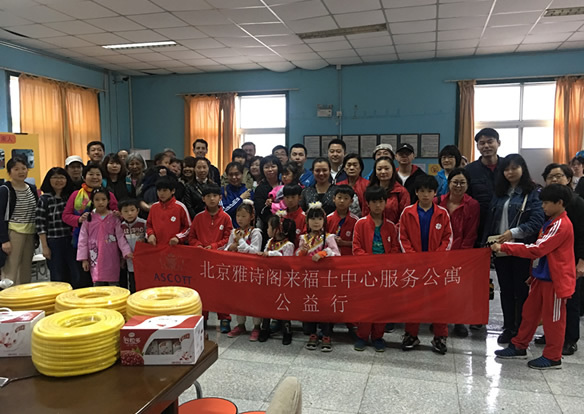 On 21st April 2018, Ascott Raffles City Beijing invited all of our residents to join us to offer their love for the special children who lives in Sunny Village. ”Sunny Village” is a charity organization, which is dedicated to help the children whose parents are in prison. During this trip, We brought some living things and food for children, meanwhile, we took some presents for all children here. Meanwhile, our residents also watched the children's performances, and picked strawberries and harmless organic vegetables at the charity farm. We really spent a meaningful weekend. 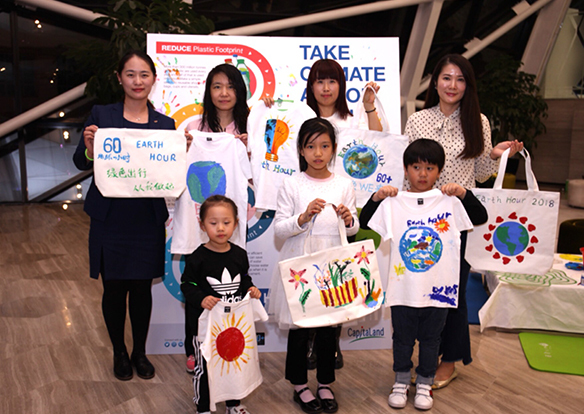 On 24 March 2018, Ascott Raffles City Beijing invited in-house residents to join in our special “Earth Hour” Event. We prepared a pledge board for guests to press their handprints, which represented the determination to participate in environmental protection. Meanwhile, we invited a painting professor, who taught residents to paint a picture of “Earth Hour” theme on T-shirts & reusable bags. At last, we presented water cups as gifts to the residents to express sincere thanks for their participation. 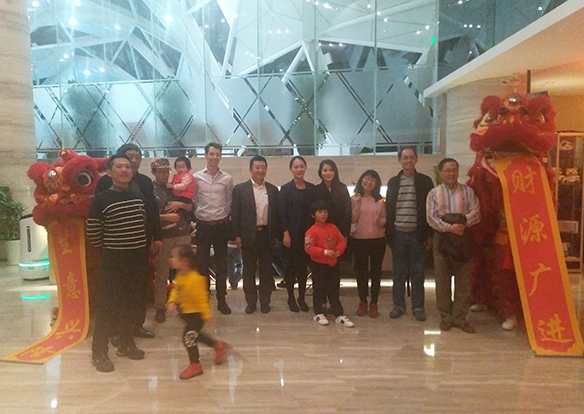 Along with the Spring Festival, Ascott Raffles City Beijing held a special Temple Fair Event for all residents. The temple fair with goodies for Chinese traditional cultural performances, snack street, various festive items, which will bring the double enjoyment of sight and taste to the residents. At that time, they can enjoy the lion dance, the martial arts performance and taste local specialties. Through this event, our residents enjoyed traditional Chinese New Year and Ascott Lifestyle. In addition, all the income will be donated to The Red Cross Society of China.